Nonstandard fields are either made of small fields or whenever nonequilibrium conditions exist; this occurs, for example, when the size of the penumbra is similar to the field size. According to these criteria, field sizes of <3 cm × 3 cm are considered to be small for 6 MV photon beam. For these fields, dosimetric errors may be larger than that in conventional beams as the reference conditions recommended by conventional codes of practice  cannot be established and the measurement of absorbed dose to water in composite fields is not standardized. Accurate measurement of small radiation fields is a well-known challenge for many dosimeters. Lack of lateral charged-particle equilibrium, dose averaging within the sensitive volume of dosimeters, and differences between the composition of detectors and their surrounding media all cause perturbations of the radiation field. Thus, discrepancies are seen between the measured dose and the actual dose that would be deposited in the medium in the absence of a detector. 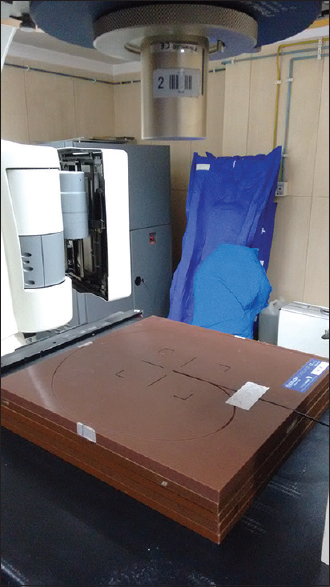 The use of small fields is becoming popular in radiation therapy and may be a source of errors if measurements are not conducted properly. Discrepancies have been observed between doses calculated by treatment planning systems and actual dose measurements which can be attributed to the presence of small fields. An important issue of the dosimetry in small field is the size of detector. The construction can significantly perturb the fluence, and the major cause of error in the measurement is due to the volume of the detector. Every detector averages the dose over its volume and this volume averaging , may underestimate dose in the center of a small field. To overcome volume averaging effect, the most straightforward and logical method is to employ a detector with a small active volume and high spatial resolution. Detectors in this category include microchambers, diodes, scintillation detector, diamond detectors, gel dosimeters, and radiographic/radiochromic film. The use of unshielded diodes has been shown to be most promising. Diodes partially solve the detector volume averaging issue. However, because of the small electron range in common diode material (such as silicon), they still represent intermediate-sized cavities for typical SRS fields. In addition, they introduce new issues that are associated with the energy, dose rate, and directional dependence of their responses. For small fields, the measurements of scatter factors are subject to many uncertainties that in turn may lead to significant errors in dose calculations. The difficulties in the accurate measurements of total scatter factor can be traced to three “equilibrium factors:” (a) The size of the detector used in the measurements, (b) the lateral electronic equilibrium in the irradiated medium and detector material, and (c) the partial occlusion of the viewable part of the X-ray source (focal spot on the target). Since there is no single detector that obeys all the three equilibrium conditions simultaneously under small and reference field conditions, different detectors, such as diode for small fields and ion chamber for reference field, should be used. The purpose of this study was to measure total scatter factors for stereotactic cones with plastic scintillation detector and its comparison against diode detector and theoretical estimates. The Extradin W1 plastic scintillator detector (Standard Imaging, USA) employs a 1 mm diameter × 3 mm length polystyrene-based scintillating fiber coupled to a 3 m long poly methyl methacrylate-based optical fiber. The radiation-induced light signals from scintillator and fiber are chromatically separated into a blue and a green component and converted into charge signals by a dual-channel photodiode enclosure attached to the distal end of the optical fiber. The photodiode signals are transmitted to an electrometer located outside the treatment bunker. In this study, the signals from the photodiodes were read using the SUPERMAX electrometer (Standard Imaging, USA), which employs software dedicated to dose measurements using the Extradin W1 scintillator detector. The characteristics of the scintillator can be found elsewhere. The EDGE Diode detector (Sun Nuclear Corporation, USA) is a waterproof dosimeter with a design that nearly eliminates the convolution of high-dose gradient regions during profile and depth measurements. It is intended for the measurement of fields as small as 5 mm. The Edge Detector diode has an active volume of 0.8 mm × 0.8 mm × 0.03 mm (0.019 mm 3). The intended field size for Edge Detector is 0.5 cm × 0.5 cm –10 cm × 10 cm. Compared to ion chambers, EDGE Detector gives approximately 100 times more signal even though it is over 6000 times smaller in volume. Measurements were performed on Novalis Tx ™ linear accelerator (Varian Medical Systems, Palo Alto) for 6 MV SRS beam with stereotactic cones (Brainlab AG, Germany) of diameter 6 mm, 7.5 mm, 10 mm, 12.5 mm, and 15 mm. The jaw settings used for all the cones were 2 cm × 2 cm as per the recommendation of manufacturer. Total scatter factor was measured in three-dimensional Scanner Radiation Field Analyzer (Sun Nuclear Corporation, USA) of diameter 65 cm and 40 cm height and controlled by software for accurate, reproducible detector positioning [Figure 1]. Figure 1: Experimental setup for measurement of total scatter factor. Measurements were made at a depth of 1.5 cm at target to surface distance (TSD) of 100 cm with the long axis of the plastic scintillator and diode detector placed parallel to the beam axis such that the active volume was positioned at isocenter. The plastic scintillator detector directly measures dose to medium with appropriate calibration unlike diode detector which measures charge produced in medium. The calibration was performed in a 30 cm × 30 cm × 30 cm plastic water phantom slab (Standard Imaging, USA) of density 1.03 g/cm 3, at 10 cm depth at TSD of 100 cm as shown in [Figure 2]. Cross-calibration was performed against reference class ionization chamber A19 (Standard Imaging, USA) of volume 0.62 cm 3 using TRS 398 protocol  at reference field size of 10 cm × 10 cm. Calibration procedure recommended by the manufacturer involves a stem effect baseline correction to determine the Čerenkov light ratio (CLR) coefficient and dose-to-water calibration to determine the gain coefficient which is described elsewhere. Figure 2: Experimental setup for calibration of plastic scintillator detector (buildup is removed for clear view of detector). The plastic scintillation detector has energy independent response, so in the calculation of total scatter factor, 10 cm × 10 cm was directly used as normalization field and there is no need of intermediate field size. Where, St is total scatter factor, M is meter reading for fixed number of monitor units, f is reference field size, and dref is depth of measurement. is a factor that corrects for the differences between the conditions of field size, geometry, phantom material, and beam quality of the conventional clinical field fclin and the machine-specific reference field fmsr.Qclin is the beam quality of the clinical field fclin. Where, f1 is intermediate field size and f2 is reference field size. Detector-specific output ratios were calculated with respect to a square jaw collimated field. For determination of scatter factor for diode detector, daisy chaining method was used. The strategy involves measurement of the ratio of readings for collimator-defined fields at the reference field size and at a medium-sized field using a suitable ion chamber, then factors were measured with a diode for the medium-sized field and the cone-defined fields, and finally the diode measurements were renormalized to the reference field ion chamber measurement by applying the ratio of the two detector readings at the intermediate field. In this study, the reference field size was 10 cm × 10 cm and intermediate field size was 5 cm × 5 cm. The accuracy of measurement of total scatter factor with plastic scintillator detector was also validated with Monte Carlo-derived theoretical estimates. The Monte Carlo simulations in the referred paper were performed by EGSnrc/BEAMnrc code with the similar machine and cone geometry of the present study. The plastic scintillator detector was calibrated against the ionization chamber, and the reproducibility in the measured doses was found to be within ± 1%. Total scatter factor measured with plastic scintillator, diode detector, and Monte Carlo estimates is summarized in [Table 1]. The measured values are reported at 1 σ.
for plastic scintillator is unity across all field sizes as its performance is demonstrated to be near ideal., For diode detector correction factor, was applied from published data. 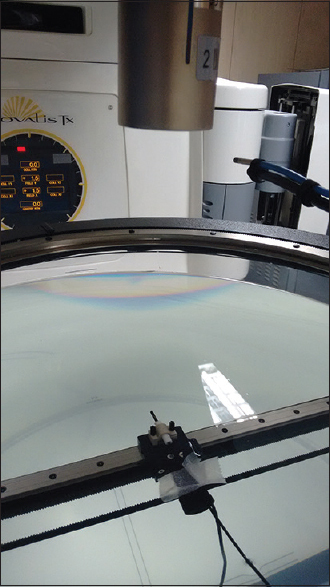 Dosimetry of small field is challenging, and the dosimetry protocols are still evolving. Although accelerators with stereotactic cones are routinely utilized for SRS treatment, there is no general agreement for total scatter factor. A range of relative output factors are in clinical use. Diodes exhibit dependence on dose rate and energy. High photoelectric cross-section of silicon (Z = 14) results in overresponse to low-energy scattered radiation., Diode overresponse is most significantly affected by the field size and diode type. The overresponse can be corrected mathematically and was found to be at an average of 0.25%. In our study, we have applied “daisy-chained” diode output factors to overcome the overresponse of silicon to low-energy scattered photons within large fields. The daisy chaining method was not used for plastic scintillator as the energy dependence of CLR calibration coefficient was found to exhibit variations within 0.4%. Literature reports beam quality correction factors for absolute dosimetry accounting for the difference between the responses of an ionization chamber in the reference field and small treatment fields. For Edge Diode, the literature reports for square fields from 0.6 cm × 0.6 cm to 2 cm. Francescon et al. reported corrections of Edge Detector using Monte Carlo simulations for Primus (Siemens) and the Synergy (Elekta). They reported that Edge Detector correction factors for 5 mm, 7.5 mm, 10 mm, 12.5 mm, and 15 mm square fields are 0.933, 0.952, 0.966, 0.976, and 0.983, respectively. Qin et al. have reported that Edge Detector correction factors for square field of 5 mm, 10 mm, 15 mm, and 20 mm are 0.97, 0.95, 0.96, and 0.96, respectively, for 6FFF beam of Varian make. We have adapted a generic of 0.97 to correct diode measurements. Dosimetry in small field is investigated by several investigators for square fields defined by collimator jaws.,,,,, Wiant et al. have reported output factors for 6 MV beam of Truebam STX (Varian) with cone diameters of 6 mm, 10 mm, 12.5 mm, and 15 mm as 0.79, 0.83, 0.871, 0.890, and 0.901, respectively. Our data are in agreement with 5.12 ± 1.75, however Wiant et al. have reported the output factors without accounting for . If their data are corrected for, the data agree well within 1.97 ± 1.70. Morales et al. have reported a field factor for Novalis equipped with circular cones using a 6 MV SRS X-ray beam with micro Diamond (PTW 60019 microDiamond) and diode detector stereotactic filed diode, IBA). They found that, for microDiamond chamber, the field factors for 4 mm, 7.5 mm, 10 mm, and 20 mm cones are 0.644, 0.799, 0.856, and 0.929, respectively, and that for diode are 0.662, 0.798, 0.851, and 0.925, respectively. We have used cones of various sizes and compared our results with the published work with similar machine and cone geometry. The measured data for both detectors agree within 5% of published Monte Carlo results. Total scatter factor measurements for stereotactic cones can be adequately carried out with a plastic scintillation detector. Our results show a high level of consistency within our data and were compared well with the published data. Validation measurements with Sun Nuclear Edge Detector diode show acceptable dosimetric agreement. Das IJ, Ding GX, Ahnesjö A. Small fields: Nonequilibrium radiation dosimetry. Med Phys 2008;35:206-15. Aspradakis M, Byrne J, Palmans H, Conway J, Rosser K, Warrington J, et al. Small Field MV Photon Dosimetry. IPEM Report No. 103. York, UK: Institute of Physics and Engineering in Medicine; 2010. Charles PH, Cranmer-Sargison G, Thwaites DI, Crowe SB, Kairn T, Knight RT, et al. A practical and theoretical definition of very small field size for radiotherapy output factor measurements. Med Phys 2014;41:041707. IAEA. Absorbed Dose Determination in External Beam Radiotherapy: An International Code of Practice for Dosimetry Based on Absorbed Dose to Water. Tech. Series No. 398. Vienna: IAEA; 2000. Alfonso R, Andreo P, Capote R, Huq MS, Kilby W, Kjäll P, et al. A new formalism for reference dosimetry of small and nonstandard fields. Med Phys 2008;35:5179-86. Laub WU, Wong T. The volume effect of detectors in the dosimetry of small fields used in IMRT. Med Phys 2003;30:341-7. Bouchard H, Seuntjens J, Duane S, Kamio Y, Palmans H. Detector dose response in megavoltage small photon beams. I. Theoretical concepts. Med Phys 2015;42:6033-47. Khelashvili G, Chu J, Diaz A, Turian J. Dosimetric characteristics of the small diameter brainLab™ cones used for stereotactic radiosurgery. J Appl Clin Med Phys 2012;13:3610. Therriault-Proulx F, Briere TM, Mourtada F, Aubin S, Beddar S, Beaulieu L. A phantom study of an in vivo dosimetry system using plastic scintillation detectors for real-time verification of 192Ir HDR brachytherapy. Med Phys 2011;38:2542-51. Carrasco P, Jornet N, Jordi O, Lizondo M, Latorre-Musoll A, Eudaldo T, et al. Characterization of the Exradin W1 scintillator for use in radiotherapy. Med Phys 2015;42:297-304. Guillot M, Gingras L, Archambault L, Beddar S, Beaulieu L. Spectral method for the correction of the Cerenkov light effect in plastic scintillation detectors: A comparison study of calibration procedures and validation in Cerenkov light-dominated situations. Med Phys 2011;38:2140-50. Dieterich S, Sherouse GW. Experimental comparison of seven commercial dosimetry diodes for measurement of stereotactic radiosurgery cone factors. Med Phys 2011;38:4166-73. Underwood TS, Rowland BC, Ferrand R, Vieillevigne L. Application of the Exradin W1 scintillator to determine Ediode 60017 and microDiamond 60019 correction factors for relative dosimetry within small MV and FFF fields. Phys Med Biol 2015;60:6669-83. Francescon P, Beddar S, Satariano N, Das IJ. Variation of kQclin, Qmsr (fclin, fmsr) for the small-field dosimetric parameters percentage depth dose, tissue-maximum ratio, and off-axis ratio. Med Phys 2014;41:101708. Qin Y, Zhong H, Wen N, Snyder K, Huang Y, Chetty IJ. Deriving detector-specific correction factors for rectangular small fields using a scintillator detector. J Appl Clin Med Phys 2016;17:6433. Fan J, Paskalev K, Wang L, Jin L, Li J, Eldeeb A, et al. Determination of output factors for stereotactic radiosurgery beams. Med Phys 2009;36:5292-300. Bucciolini M, Buonamici FB, Mazzocchi S, De Angelis C, Onori S, Cirrone GA. Diamond detector versus silicon diode and ion chamber in photon beams of different energy and field size. Med Phys 2003;30:2149-54. Griessbach I, Lapp M, Bohsung J, Gademann G, Harder D. Dosimetric characteristics of a new unshielded silicon diode and its application in clinical photon and electron beams. Med Phys 2005;32:3750-4. Liu PZ, Suchowerska N, McKenzie DR. Can small field diode correction factors be applied universally? Radiother Oncol 2014;112:442-6. Beierholm AR, Behrens CF, Andersen CE. Dosimetric characterization of the Exradin W1 plastic scintillator detector through comparison with an in-house developed scintillator system. Radiat Meas 2014;69:50-6. Francescon P, Cora S, Satariano N. Calculation of k (Q(clin), Q (msr)) (f (clin), f (msr)) for several small detectors and for two linear accelerators using Monte Carlo simulations. Med Phys 2011;38:6513-27. Klein DM, Tailor RC, Archambault L, Wang L, Therriault-Proulx F, Beddar AS. Measuring output factors of small fields formed by collimator jaws and multileaf collimator using plastic scintillation detectors. Med Phys 2010;37:5541-9. Sauer OA, Wilbert J. Measurement of output factors for small photon beams. Med Phys 2007;34:1983-8. Scott AJ, Nahum AE, Fenwick JD. Using a Monte Carlo model to predict dosimetric properties of small radiotherapy photon fields. Med Phys 2008;35:4671-84. Ding GX, Duggan DM, Coffey CW. Commissioning stereotactic radiosurgery beams using both experimental and theoretical methods. Phys Med Biol 2006;51:2549-66. Gonzalez-Lopez A, Vera-Sanchez JA, Lago-Martin JD. Small fields measurements with radiochromic films. J Med Phys 2015;40:61-7. Lárraga-Gutiérrez JM. Experimental determination of field factors for small radiotherapy beams using the daisy chain correction method. Phys Med Biol 2015;60:5813-31. Wiant DB, Terrell JA, Maurer JM, Yount CL, Sintay BJ. Commissioning and validation of brainLab cones for 6X FFF and 10X FFF beams on a varian trueBeam STx. J Appl Clin Med Phys 2013;14:4493. Morales JE, Crowe SB, Hill R, Freeman N, Trapp JV. Dosimetry of cone-defined stereotactic radiosurgery fields with a commercial synthetic diamond detector. Med Phys 2014;41:111702.